Designed for professional speed skaters. Exclusive 7 ball design inline bearing. 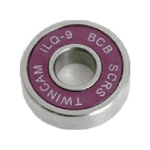 29% lighter than 608 bearing. Exclusive design 7 ball nylon retainer with self-lubricated material. 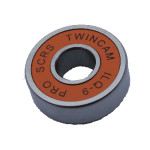 Inner ring with exclusive design “SCRS”, S-channel Rubber Shield and “DCF” – Double Contamination Free. 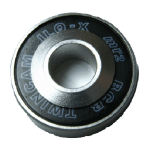 Provides the most maximum contamination free protection than any other in-line bearing in the market. Clearance designed for in-line racing. Greater loading than standard 608 bearings. Lubricant: TK Ultra Light Gel gives better protection inside balls and nylon retainer. 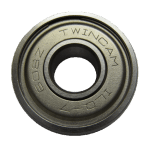 TWINCAM and ILQ are trademarks of Asia Access, Inc.
DCF patent pending "Double Containment Free"
© Copyright. Asia Access, Inc. All Rights Reserved. Designed by N3RD.Media - Web Design Development & SEO.